Tonight in Tokyo, Sony held its annual PlayStation Awards ceremony. Some of gaming’s most famous game developers gathered on stage to get awards for their games. Hideo Kojima did not. Maybe he was on vacation? Or maybe he’s attending The Game Awards in Los Angeles? Who knows. According to Yahoo! News Japan and Game Watch Impress, Metal Gear Solid V: The Phantom Pain won two awards: the User’s Choice Award and the Platinum Prize. In the past, Hideo Kojima has been a regular at the PlayStation Awards when his games have won. 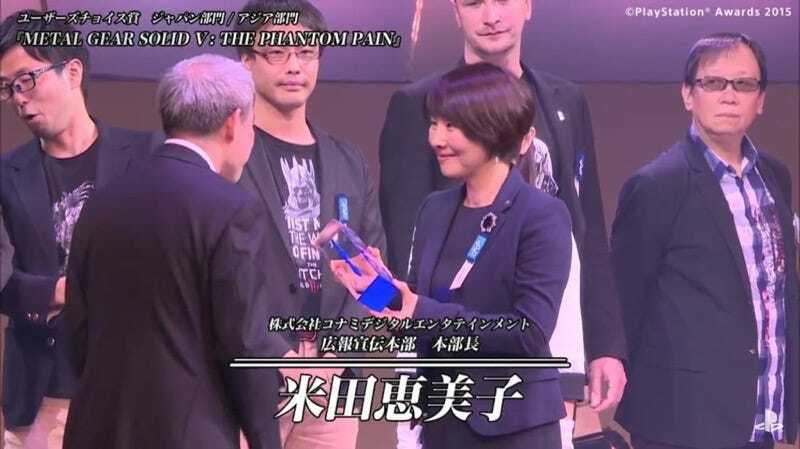 While luminaries like Dragon Quest creator Yuji Horii stood watching, the head of Konami PR took to the stage to receive the awards for Metal Gear Solid V: The Phantom Pain. Yet another entry in the seemingly endless, bizarre saga over at Konami.